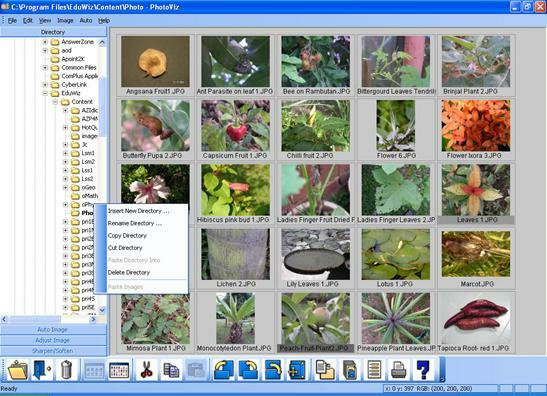 The user interface of PhotoViz consists of five areas: List Bar for directories or menus, Display Area for image files, Quick Access icons, Photo Message and Status Bar (see Figure 2.1). List Bar (Menus). There are four submenus: Directory List, Auto Image, Adjust Image and Sharpen/Soften. The directory list is a Windows Explorer-like interface to select the directory or folder for viewing. The thumbnails of the photographs in the selected folder will appear on the display area. User can expand a directory by double clicking on the folder or by clicking the “+” sign in front of the directory. Conversely, double clicking an expanded directory will collapse it. Clicking on the “-” sign in front of the expanded folder will also collapse the folder. Display Area. There are two display modes: Large and Small Icons. Images in the selected directory are represented as thumbnails for viewing and quick selection of multiple images. The color of the display area is always gray. Quick Access Icons. These icons help the user to access commonly used functions quickly. When the mouse is placed over the icons, popup text bubbles will appear to help and guide users. See Appendix A for the list of functions and their respective icons. Photo Message. Secret or hidden text messages or contents (if available) are display in this dialog box. 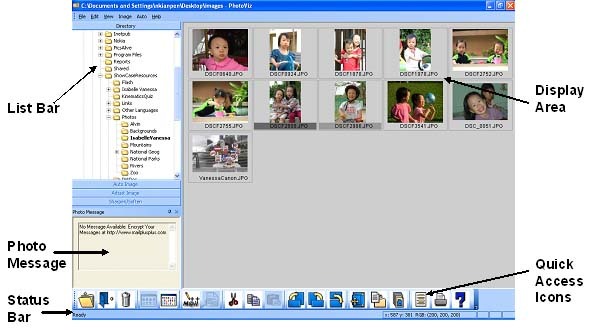 The Photo Message dialog box lets users to quickly read the hidden message, save attached documents, view web contents or execute Windows applications. Status Bar. The status bar at the bottom of the user interface displays information and instructions. Multiple images can be selected at the same time by pressing the control key and clicking the images with the mouse. When selected, the filename at the bottom of the image is highlighted. Multiple selected is useful for processing selected images in a directory, e.g. rotation, deletion or auto batch correction of selected images. The current display size as a percentage of the original size is shown at the top of the ImageViz. Users can view the next or previous image using the forward and backward arrows. This function is useful for previewing all the images in the directory. It is important to note that changes to the image are not saved until the user saves the image using the Save As icon . 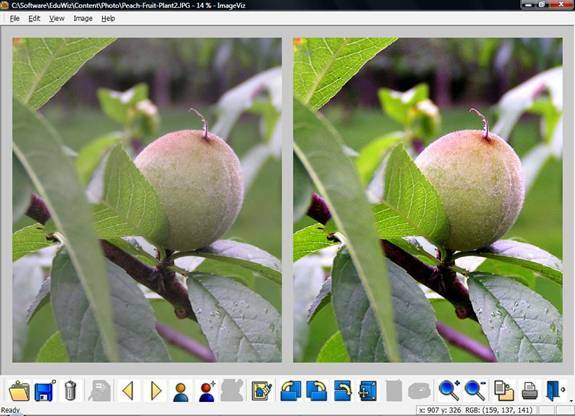 Therefore, all changes will lost when the user switches to another image or returns to PhotoViz. Quick Access Icons provide an easy avenue for the user to access the commonly used functions. A list of icons and their respective functions is tabulated in Appendix A. These icons are designed to be visually self explanatory. When the mouse is placed over the quick access icons, text bubbles appear to help and guide the user. The quick access icons are automatically enabled when the functions they represent are available to the user. Conversely, icons are automatically disabled when the respective function is not available. Functions can also be quickly accessed by right-mouse click menus. Figure 2.3 to Figure 2.4 shows the different types of menus: List Bar menu (Figure 2.3), Image menu (Figure 2.5). 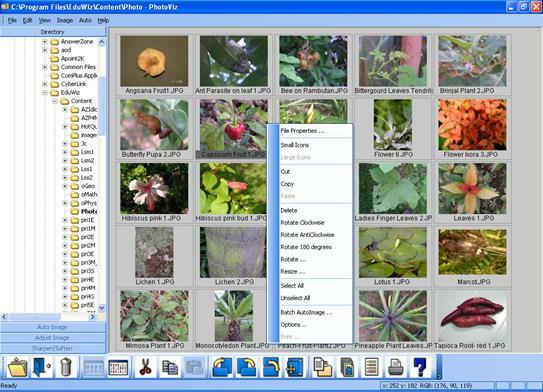 These short-cut menus not only provide quick access to PhotoViz functions but they also allow users to manage image files and directories. Users can easily cut, copy, paste, create and rename files and directories. means that the pixel at xy co-ordinate of (695,485) has a Red value of 147, Green value of 198 and a Blue value of 31. The maximum value of Red, Green and Blue is 255. The Status Bar is present in PhotoViz and ImageViz.